Microsoft Project has long been considered as a tool that can only be used with structured , rigid tasks. Typically this type of project is known as a Waterfall project (despite various blogs showing you how you can use Project to manage an “agile plan”, for example the MPUG publish one here). 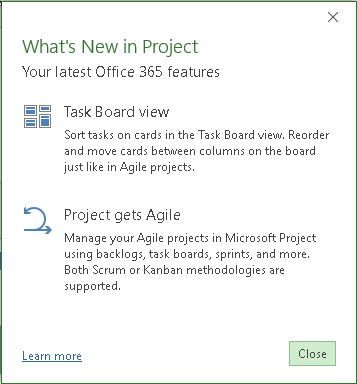 When starting Project after the update, the following “What’s New in Project” tells you what new features you can expect. 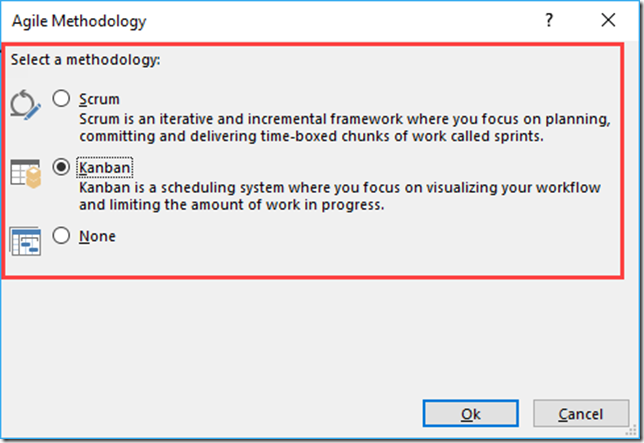 The Scrum and Kanban templates are obviously the agile ones, the Waterfall one creates a project and displays it using using the default view (defined in File | Options | Default View). In this instance then both the Waterfall Project template and Blank Project template perform the same function. The Scrum Project templates and Kanban Project templates open up in their relevant views. 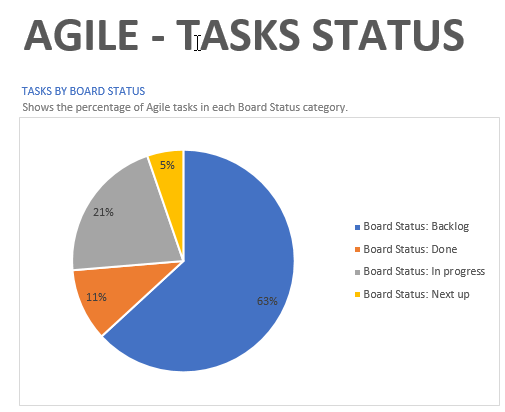 You can also plan part of a project using Agile methodologies, so you can combine plan and track relevant parts of your project using both Waterfall and Agile methods. Here I’ll quickly use Kanban to plan a wedding. 2. 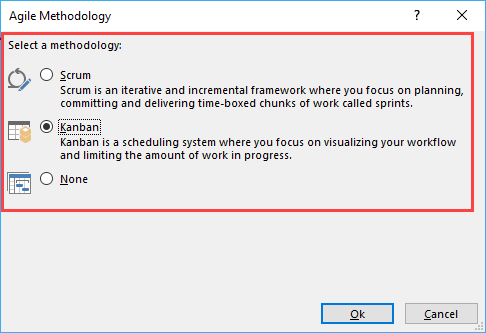 This allows me to select the Agile methodology to use. 3. 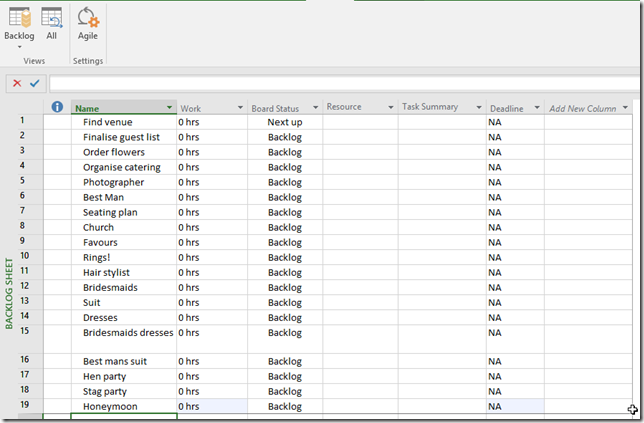 Then in the Backlog sheet, I can quickly enter the list of items to complete. Obviously this is a great opportunity for to just cut and paste items from an Excel file. 4. 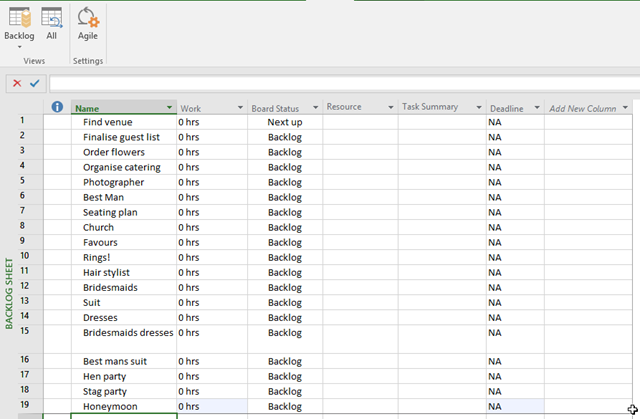 Then using the Task Board view, I can drag and drop items into the predefined buckets of Next Up, In progress and Done. I can add new columns in here too. 5. 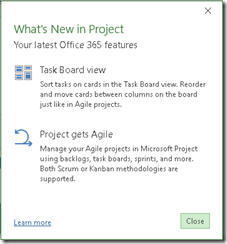 Finally, Project has a new set of Agile reports available via the reporting tab. This has been a very brief overview, but but I’ll post a couple more in depth blogs on using the Agile methodologies, especially integrated into a traditional waterfall project.